The much-awaited, long overdue decision on Kerawalapitiya LNG plant was taken by the Cabinet, but in a completely unexpected manner. The Cabinet accepted: 1. Authorise CEB to award the tender, issue a Letter of Intent (LOI) and enter into agreement to build the 300MW Kerawalapitiya LNG plant to GCL Windforce and RenewGen at a price of Rs.15.97 per unit of electricity. 2. Authorise CEB to issue a LOI and enter into agreement with Lakdhanavi Ltd. for a 300MW LNG plant, which is planned for construction in 2021, based on the proposal submitted to tender, also considering Lakdhanavi as a subsidiary of CEB. 3. In addition, both power-plants are expected to operate on LNG from day one. Above power prices are based on LNG being available at $ 10/MMBtu, a price much higher than the market. Minister Ravi Karunanayake explained to the Cabinet that the Fundamental Rights petition against the earlier tender award had been withdrawn, as such award could be carried forward. Awarding of Kerawalapitiya tender dragged on nearly three years, finally contestants came down to two, when State-owned Lakdhanavi Ltd. offered the lowest tariff rate of Rs. 14.98 per unit, China’s GCL offered a tariff of Rs. 15.97. One rupee difference between the two tenderers generating 300MW power at 75% capacity would result a potential loss of Rs. 2 billion per year. In 2016 the dollar was around Rs. 150, but with the dollar trading around Rs. 180, the loss becomes nearly Rs. 2.4 billion a year or Rs. 48 billion over the 20-year contract period. In the tender specification, the 300MW Kerawalapitiya power plant was to operate first three years on liquid fuel (diesel), and thereafter on LNG when becoming available at the plant boundary. Now, the power-plants would run exclusively on LNG. 1. Tender was called for a plant running on liquid fuel (diesel) for three years and be converted to LNG when made available. The supply of LNG is not with the tenderer. 2. When the plant runs on LNG alone, some machinery in the plant becomes redundant lowering costs, not taken into account. 3. The tender was not awarded to lowest tenderer. 4. The award of tender to Lakdhanavi is based on requirement of a 300MW LNG plant planned for construction in 2021, would contravene the Electricity Act. Also, the Minister’s Cabinet paper Sinhala and English versions are different. The Sinhala version says the award to Lakdhanavi is considering same being an associate of CEB. The English version does not mention such. “Project implementation process ran into problems due to Ministry’s own inefficiency and bad practices. Secretary to the Ministry sits as a member of SCAPC and influences the decisions which ultimately get successfully challenged in Courts. We must note the strictures placed by the Supreme Court in SCFR 394/15 Noble Resources International Ltd. vs. Hon. Ranjith Siyambalapitiya on 24 June 2016, in another procurement, particular in regard to the Secretary to the Ministry concerned. “Cabinet decided to award the project to Consortium of GCL, Windforce and Renewgen at Rs.15.97/kWh on ‘LNG only’ basis. This shall be considered as a fraud as ‘LNG only’ tariff shall be cheaper than a tariff quoted for ‘dual-fuel’. “The entire process adopted by the Ministry is illegal and violated the provisions of the Electricity Act No. 20 of 2009. As per Electricity Act, Ministry should refer the final recommendation to the PUCSL for its final approval and not been done by the Ministry. “This Cabinet is guilty of recommending two different prices for the same project awarded on the same day, thus causing Rs. 90 billion loss to the country. It is not clear what guidelines of procurement does the Ministry followed to award another LNG project of 300MW to Lakdhanavi Ltd. If Lakdhanavi is selected based on the tender invited for one LNG project, how can the Ministry recommend two bidders for two different prices for one project? “Officials of Ministry of Power and Renewable Energy during the last three-year period have done serious damage to our country due to lack of proper planning and execution capabilities at the Ministry.” End of quote. Both powerplants would require LNG; they need be imported, unloaded and delivered to the power plants. The unloading could be 1. Through a FSRU located in the sea, 2. In a less sophisticated FSRU located in a small harbour, safe-guarding the ship from currents, typhoons and tsunami and 3. Alongside of a jetty in an especially-built LNG port. This LNG unloading procedure, storage, regasification and power generation should have been discussed, planned and finalised over a decade ago. When the existing Kerawalapitiya combined cycle power-plant was established in 2006, it had the capability of running on diesel or gas, but possibility of running on gas and resulting savings was not explored. When the Indian company Caine was awarded the responsibility of exploring oil/gas in Mannar basin, country’s Engineering associations, professionals, politicians and general public should have discussed the possible steps and agree on an agenda for using the available oil or gas. When Caine discovered gas in Mannar, proposed to supply gas from Dorado well to the mainland. But the CEB, Ministry of Power and the Cabinet were caught unprepared. Although Lakdhanavi operating Kerawalapitiya powerplant was prepared to accept gas, their request fell on deaf ears. In January 2015, the new Government appointed Patali Champika Ranawaka, an Engineer, as the Minister of Power and Energy who held the position until August 2015. He presented the ‘Sri Lanka Energy Sector Development Plan for a Knowledge-based Economy, 2015-2025’ on 31 March. The plan proposes to increase country’s electricity power generation capacity to 6,400MW by 2020, generate 1000MW of electricity using gas discovered in Mannar and convert existing thermal plants to natural gas. The plan expects achieving self-sufficiency in energy and produce entire petroleum requirement by 2025, based on gas from Mannar becoming available by 2020. In emphasising above the Minister would have been mindful that gas discovered by Caine in Dorado well, estimated to have 350 billion cubic feet of natural gas sufficient to power a 300MW power plant for 20 years. The Minister’s Plan envisaged “’ormulation of a policy framework and infrastructure investment plan for the use of Natural Gas’ and Dr. Suren Batagoda was the Secretary during the preparation of Plan and would have been familiar with the Plan. According to the Plan, responsibility of policy implementation was placed with the Ministry of Power and Energy. Dr. Batagoda, although familiar with the Plan, failed to produce the ‘Policy Framework and Infrastructure Investment Plan’ for the development of natural gas as envisaged in the energy plan. Ranjith Siyambalapitiya took over the Ministry in August 2015, had little interest on policy matters, and was silent on the former Minister’s energy policy. His only qualification seems to be that he was a Royalist, a fact appreciated by Ranil. After Norochcholai power plant in 2014, the country failed to implement a single major electricity generating power plant. Meanwhile, country’s electricity demand increases by 70-80 MW per year, creating a major energy crisis by 2020. The CEB Engineers Union is interested only on coal and refused to consider alternatives. The country has exhausted major hydro-power potential and environmental issues will not allow future coal plants. Which leaves only solar, wind-power, dendro, small hydro and LNG; but only LNG could supply high volumes of power. Thus LNG would be the major source of future power. Since the 1990s CEB continued to purchase power from Private Power Producers (PPPs) at high prices and although contracts have expired, continue to extend contracts due to power shortage. Kerawalapitiya tender exposed that LNG based power could be delivered around Rs.15 a unit, whereas power from PPPs are purchased from Rs. 25 to 40 a unit. 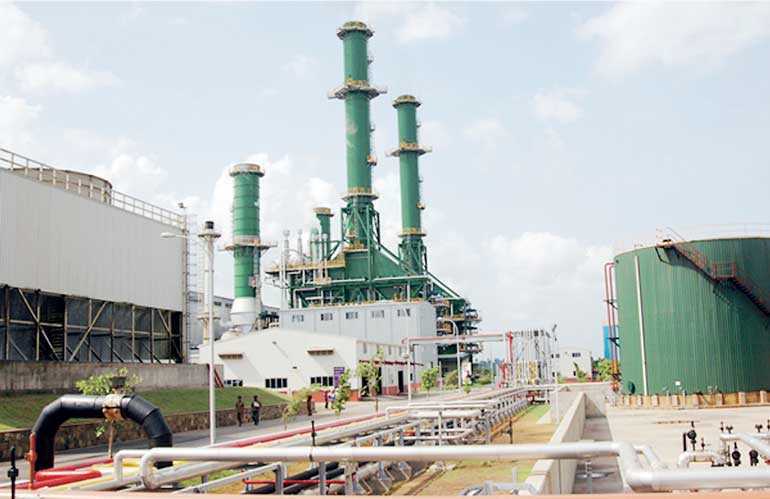 The country’s thermal power generating capacity is around 2,230MW. Currently, power production barely meets the demand and until LNG power plants come into stream, satisfying the demand would be a challenge. The cost of power generated by thermal plants vary from Rs. 25 to 40 per unit vs. Rs. 15 from LNG. Thus, if thermal power plants work at 60% capacity due to power shortage and purchased at Rs.28 (lower price) would result a loss of Rs.12.5 billion a month, showing the urgency in moving over to LNG. Moving into LNG would require a dedicated harbour to unload imported LNG. Such harbour would be smaller than a normal harbour, be around 10m deep and located north of Colombo harbour mouth. First the breakwaters need be constructed, normally rock-filled under Stage I. Under Stage II, jetties for alongside berthing could be provided. With completion of Stage I, vessels will not be exposed to rough seas, and a lower quality FSRU be acceptable. With Stage 2, LNG carriers could unload directly to inland built infrastructure, doing away with the FSRU completely. Today, even the concept of a LNG harbour has not been accepted. The acceptance of the concept by politicians and cabinet approval, harbour design considering sea depth, shape, sea-sand movement would require model analysis, environmental approval, funding, award of contracts and finally construction, would take minimum five years. Cost-wise, break-waters for Colombo Harbour expansion cost $375 million, a smaller LNG harbour would cost much less. With thermal power costing additional Rs. 12.5 billion or $70 million a month, LNG harbour is an urgent need, with contracts awarded on negotiated basis. There are number of local engineers who left the country in the 1970s and ’80s who were engaged in the oil and gas industry. They are now retired and are willing to give their knowledge free to the country. Most urgent is the preparation of ‘LNG Import and Infrastructure Plan’ with their assistance. The Sri Lanka Ports Authority (SLPA) already has sea-bed data for selecting the harbour site. With its long experience, SLPA would be the most suitable organisation for constructing the harbour. It would also be responsible for maintaining the entrance channel at the required depth. When the harbour is in operation the ships in and out would be under their guidance. The harbour built with Government funding by SLPA, operational aspects could be handed over to a new company formed under Lanka Transformer Holdings, the most experienced State-owned organisation in the country for the purpose. LTL Holdings Ltd., along with affiliate companies such as Lakdhanavi under its wings, is the largest power sector engineering company in Sri Lanka. The organisation started three decades ago as Lanka Transformers Ltd. to produce transformers for CEB, today 60% of its production is exported. The company is also engaged in rural electrification projects in East Africa since 2010, having constructed more than 2,000km of power transmission lines in Uganda, Kenya and Tanzania. They have constructed three 100MW power plants in Bangladesh and is currently constructing its own 114MW plant. The company started with Rs. 5 million investment from CEB and contribution increased to Rs. 97 million over the years. The company, having made profits every year, has paid CEB over Rs. 13 billion as dividends. Kerawalapitiya Powerplant producing 300MW of power completed in 2010 costing $300 million, is owned by Lakdhanavi, a subsidiary of LTL, with shares owned by CEB, ETF and the Treasury. The plant was built with a 50% loan from a foreign bank guaranteed by the Treasury, and the loan payment is nearing completion. Currently there are two tenders pending award, the 300MW Kerawalapitiya power-plant, earmarked to China’s Golden Concord Holdings (GCL) and the FSRU contract earmarked to SK E&S Company Ltd. of Korea. Cabinet approved the award of the contract to build Kerawalapitiya 300MW LNG plant to China’s GCL in spite of the State-owned Lakdhanavi being the lowest tenderer. The tender was evaluated six times and tender-boards decided on 4 occasions to award the tender to Lakdhanavi. It was reported that Secretary Suren Batagoda interfered on number of occasions against the tender being awarded to Lakdhanavi. When the President brought the tender award to Cabinet, UNP members refused to agree, but the following week President was able get Cabinet acceptance, indicating his personal involvement. But the award was challenged in Court. Cabinet approval in February is a modification of the former tender. Lakdhanavi over the decades has proved its abilities and paid back the capital investments made by State organisations many times over. Oil and gas technologies are extremely complicated and if Sri Lanka to benefit from Mannar gas resources, local organisations should be given every assistance to acquire such knowledge. Minister Patali Champika envisaged ‘Formulation of a policy framework and infrastructure investment plan for the use of Natural Gas’ or in simple terms a ‘LNG policy and Infrastructure Investment Plan’ and the responsibility was placed with Ministry of Power and Energy Secretary Dr. Suren Batagoda. He failed miserably, dragging down the country to the current situation. Even today, the country lacks a LNG policy. Proposed LNG power plants need supplies, policies should have been finalised four years ago. As for attempted award of Floating Storage and Regasification Unit (FSRU) to Korean SK E&S Company, a Swiss Challenge is open. The proposal envisages supply of one million tons of LNG a year on take-or-pay basis for 20 years. Meaning, even if one million tons are not consumed, the country will have to pay. India signed such an agreement with RasGas of Qatar, had to face a penalty of $ 1 billion when it violated the contract. Can Sri Lanka afford such penalty payments? The Swiss Challenge originated in the 50-day Government, which the Court ruled as illegal. Also CEB engineers are against the project and it may never get off ground. In the award of two tenders for LNG power plants, one seems to have a sinister motive behind it. The two plants would each consume nearly 350,000 tons of LNG per year. Thus if the existing Kerawalapitiya plant too is be converted to run on LNG, the total requirement would satisfy SK E&S Company’s FSRU proposal. LNG would be supplied from the FSRU at an agreed price, much higher than open market, especially when the world is facing a LNG glut and prices are falling. Using one million tons of LNG a year would require running the power-plants continuously for 20 years. If power plants were to be shut down for any reason, the country will be forced to pay heavy penalties. In addition, with LNG supplied by SK E&S, no investor would be interested in exploring gas reserves in Mannar. If the Energy Plan and the Infrastructure Plan was implemented as envisaged, by now the country’s power would be LNG based with thermal power plants discontinued. Current power problems are a result of non-preparation of a LNG policy for the country. Power shortage would require increased utilisation of thermal power, at 60% usage would cost additional Rs. 12.5 billion a month, increasing every year. Until the LNG import infrastructure and LNG power plants are in place, the citizens would be forced to face power-cuts. As the Cabinet colleague pointed out in his Observations, the entire tender process is illegal and immoral. The award would be challenged in Court and contracts would not materialise during the tenure of this Government. Failure to prepare the LNG Policy and Implementation Mechanism due to negligence of Suren Batagoda will cost the country Rs. 750 billion over the next five years; it is the biggest blunder by any administrative officer in the country’s history and the citizens will be forced to pay.